We are new fulltimers. One thing we have learned though, is that if there is one thing that most "fulltimers" will agree on, it's that it's hard to agree on a "method" to fulltiming. If you ask 10 different fulltimers how they fulltime or why, you will get at least 7 different answers. And by the way, you may as well just right click "Fulltiming" right now and select "add to dictionary". I hate those red squiggly spell-checker lines! This is a lot what it feels like to us in our 5th wheel! We are not "camping". We are not "on vacation". It's not like we are camping all the time. Maybe a little at first, since we were avid RVers long before we became Fulltimers. That wore off soon though. We are not retired, so there is still work and that quickly kills any notion that we are on any sort of vacation! We are living in a very small home. We like to call it our "Jeanie Bottle". Really, the routine of our life is no different than anybody else's. We get up in the morning, go about our daily routine, and go to bed at night. To us, much of fulltiming isn't so much about where we live or how we live, but the awareness that, at any time, we can change our "neighborhood". This is the essence of the lifestyle. True, we usually stay where we are for long periods of time, but we are free to leave any time we want with almost no effort at all. Some fulltimers move all the time, every few days or weeks. Others prefer to stay put all winter in one place and all summer in another place. I would say most are somewhere in between. We look forward to retirement when we can also enjoy the pleasure of no particular reason to stay anywhere. For now, we are fairly stationary in a park hosting job that suits us perfectly. It's in a perfect location for us and it gives us some much needed experience in park hosting. We are building our resume for the future when we plan to participate in "Work Camping" at some level to offset living expenses for part of the year. It has been a lot of fun getting to know our new home, and we were amazed at how quickly it felt like "home" after living 20 years in a house that we built ourselves. We expected a lot of emotional turbulence moving out of the house, but it has been far easier than we anticipated. We have also been surprised by how much we don't miss our "stuff". Everybody has too much "stuff". There have been many books written on how to simplify your life, and most of them involve the thinning out of your belongings. Most of us have heard the sentiment that we are a "slave to our stuff". After getting rid of nearly everything we own, we completely agree. One of the more fun things has been taking our trailer to other locations after moving into it. 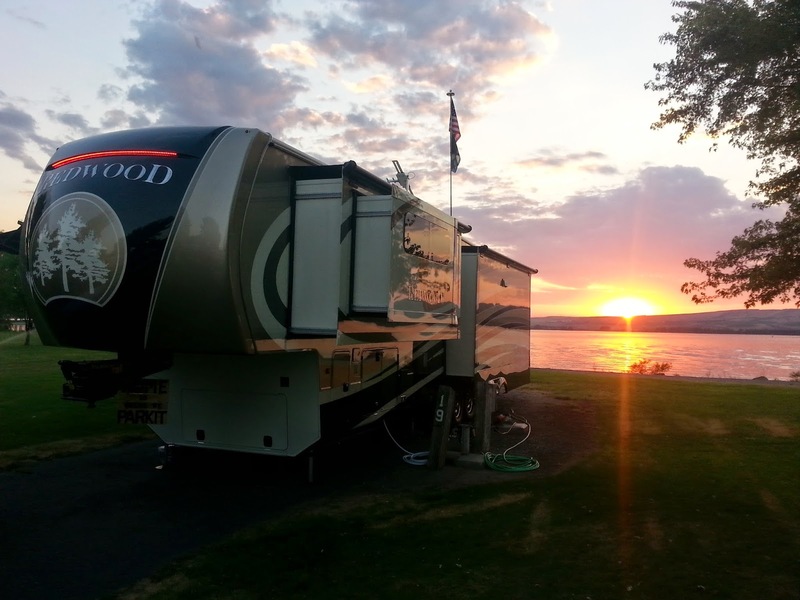 Our first real "vacation" was an annual 10 day trip we take with many friends to a campground that is right on the mighty Columbia River. I remember that first morning when I came down from the bedroom to get coffee and was greeted by the surprise of a gorgeous view outside of my familiar living room window. It was like in the Wizard of Oz when the house was dropped via tornado into a completely new and magical location! DELIGHTFUL! We don't have to pack or prepare much to "go on vacation" we just hitch up and GO! One of the other hallmarks of fulltiming that we greatly enjoy is the friendships you gain as you travel. Almost all fulltimers remark on what an unexpected surprise it was when they were expecting to be on a more solitary existence as they left friends and family and began travelling, only to discover that they became part of a whole new "family" of other fulltimers and "longtimers" that are enjoying the same lifestyle. Rallies, clubs and memberships help you tailor your travels to what suits you best, and inevitably, you meet others who are like-minded. There are endless groups that meet up on a regular basis to enjoy common interests. This is something that most "stick and bricks" dwellers don't get to experience at this level. We love this aspect of fulltiming. So what are the downsides? I would have to really give that some thought. We have 4 children, and I miss having them all over to my house, filling it with their voices and their antics. The big family dinners and the casualness of them stopping by without calling first, coming by to borrow some tool of dad's or to get something from the barn they needed... I do miss that a lot. But I focus on the fact that they have their own homes now and it's perfectly alright to pass that torch to them. THEY can now have US stop by in the same capacity. Other than that, I am actually hard-pressed to think of any real downsides... We are not "building equity" in real estate, but to be honest, nobody is. Certainly not fast enough to cover property taxes and maintenance and improvement costs that all homeowners shoulder. Owning a house now (and in my opinion the foreseeable future) is NOT an equity-building equation. Whether fulltiming is for you or not is a question only you can answer. You need to take a very honest, hard look at your life, your relationship with your partner, and what you really need to be content. You also need to have the courage to receive the inevitable scorn and disbelief that you will get from friends and some family. We had that, and know that we will continue to have it. Many people associate "living in a trailer" as some sort of lonely, desolate, desperate situation. We couldn't disagree more. In fact, we have found more often than not, a deep envy from many of our friends and family that they cannot enjoy the same freedom as we do. Fulltiming is perfect for us. I hope that if you think it might be perfect for you, you will go ahead and look into it. There are many resources on line for you to get started. Attend RV shows and sit in different rigs and visualize. Read other blogs and listen to podcasts. Click the link on this blog titled "Blogs We Love" to get you started. It's a wonderful life for many, and all it takes is an open mind. The rest follows quite naturally!